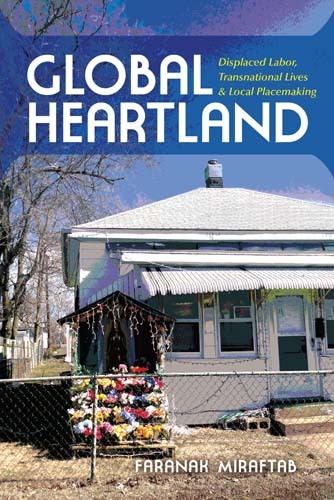 Global Heartland is the account of diverse, dispossessed, and displaced people brought together in a former sundown town in Illinois. Recruited to work in the local meat-processing plant, African Americans, Mexicans, and West Africans re-create the town in unexpected ways. Drawing on ethnographic research conducted in the US, Mexico, and Togo, Faranak Miraftab shows how this workforce is produced for the global labor market; how the displaced workers’ transnational lives help them stay in these jobs; and how they negotiate their relationships with each other across the lines of ethnicity, race, language, and nationality as they make a new home. Beardstown is not an exception but an example of local-global connections that make for local development. Focusing on a locality in a non-metropolitan region, this work contributes to urban scholarship on globalization by offering a fresh perspective on politics and materialities of placemaking.